BALTIMORE -- Average would have been enough. 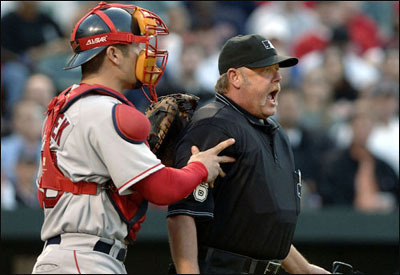 BALTIMORE -- A year ago this morning, Jason Varitek had 15 RBIs on the season. This morning he has 18. However, a year ago he was hitting .318 with 7 home runs. Now he's hitting .243 with 3 homers. The good news: Varitek reached base five times last night, walking three times, singling in a run in the third, and launching a two-run home run to dead center in the ninth off John Halama. With the homer, he came around to score his fourth run of the night.